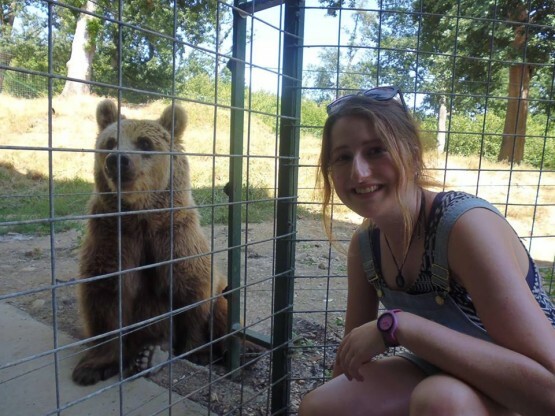 I decided to take a semester’s break from my university degree and to do volunteering in Romania at the Libearty bear sanctuary. At the bear sanctuary, the daily roles myself and the other volunteers were involved in included sorting local supermarket food donations of; fruit, vegetables, meat, dairy, fish and breads. This may have been a messy task, but it was rewarding, as not only did we assist in feeding the bears but we also freed up the time of the sanctuary’s staff members. Towards the end of my five week volunteering project the number of tourists and local people visiting the sanctuary increased, which led me to take on a different role within the sanctuary, where initially I assisted with the sanctuary’s guided tours, before being capable of taking my own English speaking tours around the sanctuary. It was fantastic to see so many visitors taking an interest in the welfare of these animals, whether they were local or international visitors. Within this project, I started volunteering in Romania in a dog shelter, which is located in Brasov (the town where Oyster’s volunteer flat was located). Volunteering at the dog shelter was an extremely rewarding experience, as majority of what is needed is to help with walking the dogs and playing with the puppies which are desperate for attention. I enjoyed my time volunteering in Romania so much that I wanted to go back. So I did. After travelling around Europe for a month I returned to Brasov for another few weeks of volunteering. The staff at both the sanctuary and the dog shelter were helpful and friendly, which made the work very enjoyable. I loved the relaxed attitude of the people I met within Romania, who made my trip such an enjoyable experience. It was fantastic to gain such a positive experience and to feel like I was helping out a much needed and important cause. For more information about volunteering in Romania with bears and dogs, have a look at Oyster Worldwide’s Romania volunteering webpage.